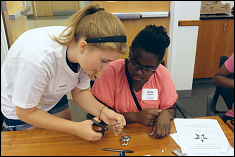 "With this workshop, we want to both educate and empower young women"
On Saturday, October 5, 2013, over sixty girls gathered at the University of Maryland to participate in the Maryland Cybersecurity Center's second Cybersecurity and Cybersafety Workshop for Girls. The event was attended by girls in grades 6-8 from Maryland, Virginia, and Washington D.C. The participants arrived eager to learn about the meaning of cybersecurity, and how internet safety and security impacts their everyday lives. After an introduction and an ice-breaker activity, the girls were separated into smaller groups which rotated through four stations throughout the day. The girls were challenged to work together and use creativity while participating in the hands-on and interactive activities. Each station was led by enthusiastic UMD undergraduate students, most of whom are students in computer science or engineering. Some of the activities included lock-picking (used as a metaphor for internet security), creating strong passwords, determining information that is available on the internet, and protecting your computer by avoiding spam and malware. "With this workshop, we want to both educate and empower young women," said Cristin Caparotta, Coordinator of the workshop and Graduate Assistant for Education at the Maryland Cybersecurity Center. "As middle school students, these girls are beginning to explore and define their interest areas, and we want them to feel confident and competent in both using technology in everyday life and in pursuing STEM [science, technology, engineering and math] fields of study. By learning from undergraduate role models at the workshop, we are demonstrating that these goals are attainable." At the end of the program, each group presented on one of the activities to a large crowd of parents to show what they had learned in that activity. The girls were excited to share their new information, skills, and discoveries with their families.